"I just want to know who I am." This animated tale is the story of an orphan, named Ana (Meg Ryan), who searches for a family she doesn't remember. At the beginning the Grand Duchess Marie (Angela Lansbury), Grandmother of Anastasia, is telling the story of Imperial Russia, how things use to be. This scene is in the Imperial Palace's ballroom where a grand party is being thrown. This scene is the most important because there is a side conversation going on between Anastasia and her grandmother. I like this scene because the animation and sound effects of the background aren't left out so that the scene can focus on just the conversation. This makes the story seem more realistic. The grandmother is saying good-bye to her favorite and youngest granddaughter, Anastasia, because she is leaving to Paris, France. The Grandmother gives Anastasia a music box that can only be opened up with the key that grandma places around Anastasia's neck. Two times later on in the movie Ana sees the music box and has memories flashing of her past at Imperial Russia as the Grand Princess Anastasia. During these flashes of memory music plays and the view of Anastasia seems as if the camera is rotating around her, instead of being animation. All of a sudden the ballroom grows dark and Rasputin (Christopher Lloyd), the once loyal confidant, announces a curse on the royal Romanov family, and everything goes into chaos as the family is trying to flee Rasputin's curse. Only Anastasia and her grandmother do not die, but Anastasia is left behind in Russia while her grandmother jumps on a train to Paris. Years later a young women who suffers from amnesia leaves her orphanage for St. Petersburg to start her first day at work. Instead she finds her way to two scheming conmen, Dimitri (John Cusack) and Vladimir (Kelsey Grammar), who are looking for an Anastasia look-alike to swindle the grandmother for the reward money. Eventually they convince her she may be the Grand Princess Anastasia. While on the journey to Paris Rasputin follows, and they get into all sorts of danger. You see, Rasputin is dead, but he is the walking dead, his corpse falling apart because to get his power to kill the Romanovs he sold his soul. The glass case containing his power is returned to him by his assistant, Bartok the bat. Bartok isn't up for revenge, or out to kill anyone, like Rasputin. Bartok only seems interested in impressing Rasputin. Bartok also has his own animated movie called Bartok the Magnificent, by the same animators as Anastasia. You'll have to watch the movie yourself to see what happens! 2 sing alongs: Once Upon A December and Learn To Do It. Extras Review: There are two sing-a-longs on the DVD, Once Upon A December and Learn To Do It. 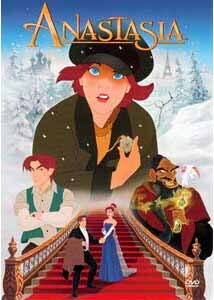 Also, there is Anastasia: A Magical Journey, a look at how Anastasia was made. It's hosted by Aaliyah, one of the musical voices on the Anastasia soundtrack. A Magical Journey shows the actors saying and singing their lines for their animated characters. There is also a behind the scenes look at the music performers, and how the animators connect drawing with the motions and facial expressions of the actors, which is called "live action reference. "Also included are a featurette, the original theatrical trailer, Bartok's trailer, three interactive puzzle games (you control where the pieces go by using the arrows on the DVD remote). I think this is a great movie because you can almost put yourself in the characters shoes because they go through so many emotions that you can relate. This is one of the few animated movies that adults can watch as well as kids.